GoXtra News: Attention hipsters, patriots and just plain progressive stand-up fans: The future of comedy is coming, sooner than you think! Attention hipsters, patriots and just plain progressive stand-up fans: The future of comedy is coming, sooner than you think! Sifiso Nene, Mpho Popps and Schalk Bezuidenhout live and hilarious! 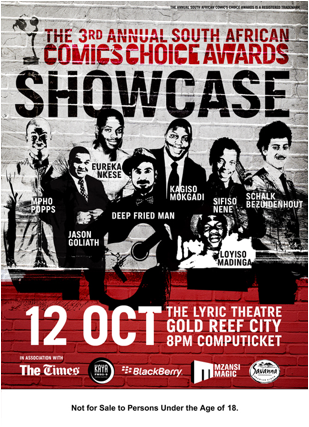 After the electrifying CCA Show held in August to rave reviews – The Comic’s Choice Awards team are thrilled to present “Showcase” 2013 which takes place at the Lyric Theatre, Gold Reef City Casino, Gauteng at 8 pm on Saturday, 12 October 2013. “The Future of Stand-Up Comedy” is how the show is described as selected nominees and winners of two categories – the Savanna Newcomer Award and the The BlackBerry® Breakthrough - take the stage and bring down the house in a signature CCA-quality show. Exploding onto the South African comedy scene are Schalk Bezuidenhout, winner of this year’s Savanna Newcomer Award and the three nominees in his category:Kagiso Mokgadi, Loyiso Madinga and Eureka Nkese. From the BlackBerry® Breakthrough Act Award category, you’ll be clutching your belly in laughter with outstanding comedy from this year’s winner Mpho Popps Modikoane, and the nominees in his category Jason Goliath and 2011 award winner Deep Fried Man. Donovan Goliath is the one nominee that is regrettably not in the country for the event. Also performing at the CCA Showcase 2013 is Savanna Audience Choice Award winner, Sifiso Nene, who has become a hot favourite across the comedy landscape of South Africa. Tickets at Computicket from R120. The 3rd Annual South African Comic’s Choice Awards™ is supported by The Times, Savanna, BlackBerry®, Mzansi Magic and Kaya FM.